Water can take many forms depending on how you treat it. Freeze it and it becomes ice. Heat it and it becomes steam. Now, the ionator HOM uses ingenious technology to give water a tiny electrical charge. The water then becomes ionized, which makes it a powerful cleaner and sanitizer. The technology driving the ionator products has been used for decades in food processing plants, four-star restaurants, and large hotels. Since it’s just water, you can spray it where your kids and pets eat. You can even spray a pacifier or fruit, and you can spray your kids too! It won’t replace every cleaner in your house; you’ll need some cleaners for the toughest cleaning jobs, but it’s great for everyday cleaning and sanitizing. It will definitely free up some space in your cleaning supply cabinet. You heard it from me first…just like every home has a vacuum cleaner, every home will have an ionator HOM. We also carry a heavier duty ionator EXP for commercial use in places like offices, restaurants, schools and gyms. What are the Benefits of the ionator HOM? Environmental: From kitchens and bathrooms, to bedrooms and playrooms — you can clean them all without leaving behind any chemical residue. The ionized tap water cleans without chemicals and is harmless to people and the environment. The ionator hates dirt, loves people. Plus, you eliminate the enormous packaging waste from using general purpose cleaning chemicals. Personal Health: Virtually the only cleaning and sanitizing product in the world without a chemical-related health warning label! 40% of calls to US Poison Control Center are related to ingestion of cleaning chemicals. When used as directed the ionator kills or removes more than 99.9% of harmful germs without the use of chemicals, including H1N1 virus, E-Coli, and Staph. Savings: Eliminates the repeated expense of buying general purpose cleaning chemicals, saving hundreds of dollars each year. Quality: Independent cleaning test results demonstrate that Activeion technology is as effective as popular chemical cleaners for cleaning multiple surfaces. Sanitizing occurs in 6 seconds, versus 10 minutes for leading concentrated commercial cleaners. Come On, Does It Really Work? : YES! When the trigger on the ionator HOM is pressed, the tap water flows into a water cell where a slight electrical charge is applied to the water. The charged water then passes through an ion exchange membrane to create an oxygen-rich mixture of positive and negative “nano-bubbles.” When applied to surfaces, this ionized water attracts dirt like a magnet helping to lift it from the surface and allowing it to be wiped away. The ionized water returns to its natural state after 30-45 seconds. Do’s: It’s designed for quick and easy cleaning around your home, in your car, or at your office. Use it to clean glass, stainless steel, natural stone (such as granite or marble), tubs, showers, sinks, finished wood floors and surfaces, carpet spots, fabrics, and more. On a scale of 1-10, 10 being a cleaning job that requires the strongest cleaning agents available, this product is good for cleaning jobs rated 1-7. Best used with Green Irene microfiber cleaning cloths. Don’ts: Does NOT work well on synthetic oil, such as car oil on garage floor. Do not use distilled or purified water, as the ionator technology requires some mineral content in the water to function properly (the hardness or softness of the water does not matter). Do not add scent or anything other than tap water. Do not used on unfinished porous surfaces. 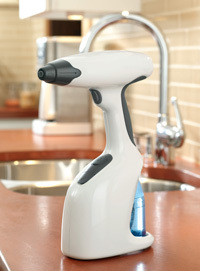 Directions for Use: After charging the battery, fill the reservoir with plain tap water and squeeze the trigger to spray the surface to be cleaned. Wipe surface dry with a clean microfiber cloth. As you squeeze the trigger, a green light in the reservoir indicates that the device is working properly. For sanitizing, spray surface for 6 seconds at a distance of 3 to 4 inches (do not spray the cloth). Contact me, your local Green Irene Eco-Consultant.